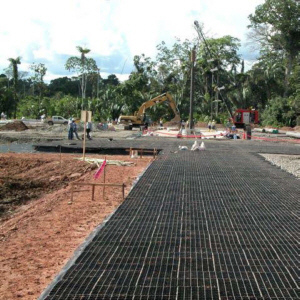 CREATE SUSTAINABLE ENVIRONMENTS & STABILIZING CHALLENGING ENVIRONMENTS WITH REINFORCED SURFACES. Robust mats made from a unique high strength polymer blend. Mat sections are bolted together. Use of a drill driver secures bolts FAST. Yellow bolt delineators are available for edge or centerline marking.